Zone tapes are ideal if you need an adhesive backed tape but do not want the adhesive in contact with the heating platton. A strip of adhesive is applied to each edge of the PTFE tape. 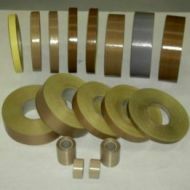 This also improves heat transfer through the PTFE tape which can reduce sealing time for your process. The CHEMSTIK® range of products comprises Teflon® (PTFE) coated woven glass fabric with pressure sinsitive adhesive on one side. CHEMSTIK® is produced with either a Silicone or Acrylic pressure sensitive adhesive. Silicone adhesive products have a continuous operating temperature range of -70ºC to +260ºC.